Since her initial training at Yoga by the Sea in 2013, Lori has continued to explore and expand her education and training, finding her path in the direction of Therapeutic Yoga and Trauma Sensitive Yoga. Lori’s dedication has brought many wonderful opportunities to share her experience and understanding with groups in Mental Health and Addictions, Community Services, Yoga Outreach, and with the Mental Health Commission of Canada in Ottawa. 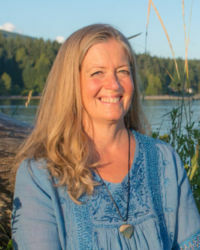 Lori is certified in the Amrit Method of Yoga Nidra, a graduate of Langara College’s Therapeutic Yoga for Pain Management, Advanced YTT with Amrit Yoga Institute, CYT 500, and is currently studying advanced Trauma Sensitive Yoga with the Trauma Resource Centre out of Boston, Mass. In her personal lived experience, yoga has had a profound impact in healing, self-care, wellness, awareness, and subtle yet significant shifts in daily living. Yoga has become a way of life that is present in relationships, community, and her career in Mental Health. Throughout all, Lori is deeply devoted to sharing yoga as an experience of empowerment. Whether in Restorative Yoga, Yoga Nidra or in a regular Hatha class, Lori brings a compassionate approach to her teaching, with clarity and a spark of humour. Lori loves teaching and having the opportunity to share what she has received. You can find Lori on Facebook or Instagram at EmpowerYoga. Lori is available for individual or small group private workshops and sessions. lori.empoweryoga@gmail.com.